According to the South African National Institute for Communicable Diseases (NICD), sporadic listeriosis cases are reported in the country. The first documented outbreaks of listeriosis were in 1977. Between August 1977 to April 1978, 14 cases were reported in the Johannesburg area. In 2017, the NICD reports a total of 557 laboratory-confirmed listeriosis cases from all provinces since the beginning of the year. Most cases have been reported from Gauteng Province (62%, 345/557) followed by Western Cape (13%, 71/557) and KwaZulu-Natal (7%, 37/557) provinces. As of 29 November 2017, case investigation forms of variable completeness have been received for 192 cases. 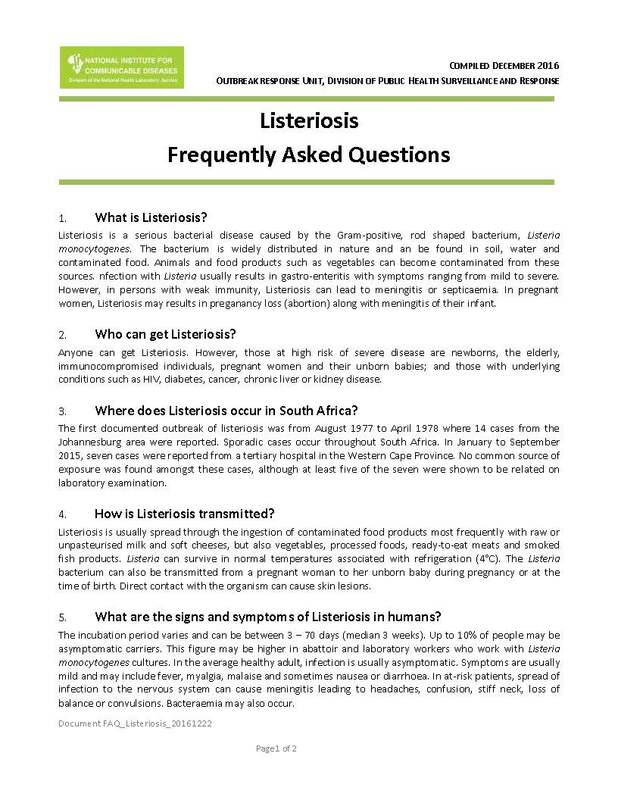 Apart from neonates (≤28 days) and the elderly (>65 years), additional risk factors for listeriosis reported include pregnancy (10/39 females aged 15-49 years) and HIV infection status. In non-neonatal cases where HIV status was known (n=63), 62% (39/63) were HIV positive. Maternal HIV status is known for 57 neonatal cases, of which 22/57 (38%) were HIV positive. Final outcome data is available for 12% (70/557) of cases, of which 51% (36/70) died. Listeria monocytogenes, the common food-borne bacteria depicted in this illustration based on electron microscope imagery, can cause miscarriage, stillbirth and premature labor in pregnant women. Limited food consumption history data are available, and indicate that a wide variety of food items documented to have caused previous outbreaks/clusters of listeriosis (including dairy products, meat products, vegetables, fruit, and ready-to-eat products) were commonly consumed, and no specific food item/s or food consumption patterns that could guide targeted environmental investigations have been identified as yet. Listeria monocytogenes is bacteria that is normally found in the environment and has been found in animals, birds and vegetation. It can be found in raw foods and processed foods that get contaminated after processing. Some of the most common foods that are associated with listeriosis are raw milk, soft cheeses, vegetables, and many ready to eat meats like hot dogs, deli meats and pâtés. Those at greatest risk of serious listeria infection include pregnant women, newborns, the elderly, and adults with weakened immune systems (AIDS patientshave a significantly high chance, up to 300 times, of contracting the disease). Most healthy persons show no symptoms of this disease. Initial symptoms of food borne listeriosis include fever, muscle aches, fatigue and sometimes gastrointestinal symptoms, such as nausea, vomiting, or diarrhea. Primarily in high risk groups but occasionally in healthy adults, the infection can spread to the blood and central nervous system where it can cause sepsis and meningitis. Due to a naturally depressed immune system, pregnant women are about 20 times more likely than other healthy adults to contract this disease. Though many women may only experience mild flu-likesymptoms,infections during pregnancy can have devastating consequences to the fetus which include stillbirth or miscarriage, premature delivery and serious infections in the newborn. • Thoroughly cook raw food from animal sources, such as beef, pork, or poultry. • Wash raw vegetables thoroughly before eating. • Keep uncooked meats separate from vegetables and from cooked foods and ready-to-eat foods. • Avoid unpasteurized (raw) milk or foods made from unpasteurized milk. • Wash hands, knives, and cutting boards after handling uncooked foods. • Do not eat hot dogs, luncheon meats, or deli meats, unless they are reheated until steaming hot. • Avoid getting fluid from hot dog packages on other foods, utensils, and food preparation surfaces, and wash hands after handling hot dogs, luncheon meats, and deli meats. • Do not eat soft cheeses such as feta, Brie, and Camembert, blue-veined cheeses, or Mexican-style cheesessuch as queso blanco, queso fresco, and Panela, unless they have labels that clearly state they are made from pastuerized milk. • Do not eat refrigerated pâtés or meat spreads. Canned or shelf-stable pâtés and meat spreads may be eaten. • Do not eat refrigerated smoked seafood, unless it is contained in a cooked dish, such as a casserole. Refrigerated smoked seafood, such as salmon, trout, whitefish, cod, tuna or mackerel, is most often labeled as “nova-style,” “lox,” “kippered,” “smoked,” or “jerky.” The fish is found in the refrigeratorsection or sold at deli counters of grocery stores and delicatessens. Canned or shelf-stable smoked seafood may be eaten. This very hardy bacterium can survive and even grow at refrigeration temperature. Because of this factor, Listeria presents challenges in food safety. Listeriosis: a major concern for public health?